This exceptional maker worked for a number of important makers including A.Wunderlich, E.Reinhold Schmidt and H.Glass before setting up in his own shop in 1904. 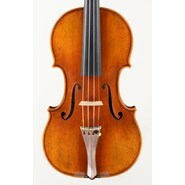 This fine violin is illustrated in the important book on Vogtland violin makers by Zoebisch (pp.194-195). 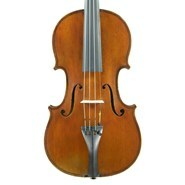 It is in superb condition and has a fine tone. 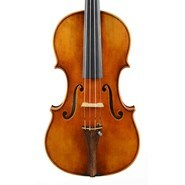 We felt that this violin was a standout from our most recent Cremona Show and decided to buy it for our collection. Marianne Jost is from Switzerland and started her training at the Cremona school of violin making in 1993, graduating in 1997. She also worked with a number of master teachers like Vicenzo and Francesco Bissolotti and Giovanni Lucci for bow making. She has won a number of awards over the years. This beautifully crafted violin has a big, brilliant responsive tone. Jules Grandjon worked in Paris and Amsterdam before opening his very successful workshop in Mirecourt in 1850. His work won a number of medals at a number of competitions at Paris and London. This is a beautiful example of his work with a big powerful tone. Paolo began his training with his uncle Arturo Virgoletti in 1999. Moving to Cremona, he worked with Elio Severgnini. While there, he had the opportunity to restore fine old instruments and study closely the work of the masters. He worked with master makers in Tokyo and Madrid before opening his own workshop in S.Polo d’Enza near Parma. This beautifully made violin has a full, rich tone with great warmth. Although born in California, Lanini studied in Italy, first with Romeo Antoniazzi and then with Farotti in Milan from 1911 to 1914 before returning to San Jose. 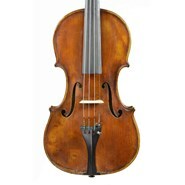 This violin is in almost new condition and has many characteristics of the maker's masters. Born in Norway in a town dedicated to intricate woodcarvings, Reindahl immigrated to Chicago in 1870, at the age of 13. A self-taught maker with a distinctive style, he set up his own shop in the Athenaeum building of Chicago in 1885, where he gained a reputation as one of America's best violin makers. By 1910 he had moved to Madison, Wisconsin, and by 1930 he had made nearly 600 violins. 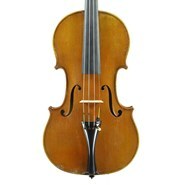 This violin, from 1903, is an excellent example of his Chicago period. With a unique scroll, deep edgework and American maple on the back, it is easy to play and is in very good condition. Paolo began his training with his uncle Arturo Virgoletti in 1999. Moving to Cremona, he worked with Elio Severgnini. While he was there he had the opportunity to restore fine old instruments and study closely the work of the great masters. He worked with master makers in Tokyo and Madrid before opening his own workshop in S.Polo d’Enza near Parma. Over the last several years, Haide Lin, who oversees both our repair and restoration workshop and our Jay Haide workshop, has won numerous medals and awards at the Violin Society of America competitions. 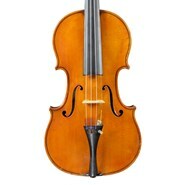 This exceptional and beautiful violin is modeled afte the work of the great J.B.Vuillaume. Tonally outstanding, this violin has a responsive tone with great depth and complexity. Neufchâteau, circa late 19th Century. Over the years we have been able to offer several violins from the workshop of the Caussin family. As with this fine example, they are usually reproductions of the classical Italian masters and have excellent tonal qualities. Pisano (near Milan). We have several examples by this maker. See more detailed information. Gustave Villaume was born in Mirecourt and studied with Mougenot and Jacquet Gand before going to Paris to work with Caressa & Français. After moving to Nancy, he won numerous awards for his work. Kurt Lothar and his father came to this country from Klingenthal, Germany in the early 1950s. 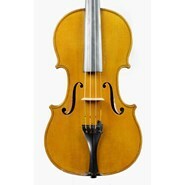 They were raised in a famous family of violin makers going back to the late 1700's. Their work has always been highly respected all over the country. This fine example of K. Lothar's work has a powerful, brilliant tone. This exceptional violin from the Roth Markneukirchen workshop before their move to Erlangen, represents their finest work equal to or exceeding their best work from the 1920’s. The tone is rich and powerful, a sound that would appeal to many. The Aschow family were the most important makers and dealers in the San Francisco East Bay area for almost 70 years, closing in 1969. John was born in Denmark and studied at the violin making school in Mittenwald before coming to this country at the beginning of the last century. He eventually established a violin shop in Oakland, California, in 1906, one of the premier shops in the Bay Area. His son continued the business until 1969. 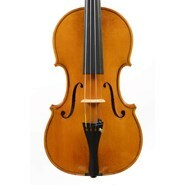 Aschow produced about 200 instruments of distinctive quality.